Lívia Suarez, who runs La Frida Bike, arrives at the Dendê Valley boot camp for entrepreneurs in Salvador's city center. Paulo Rogério Nunes is a cofounder of Dendê Valley, a consultancy and startup accelerator in Salvador. 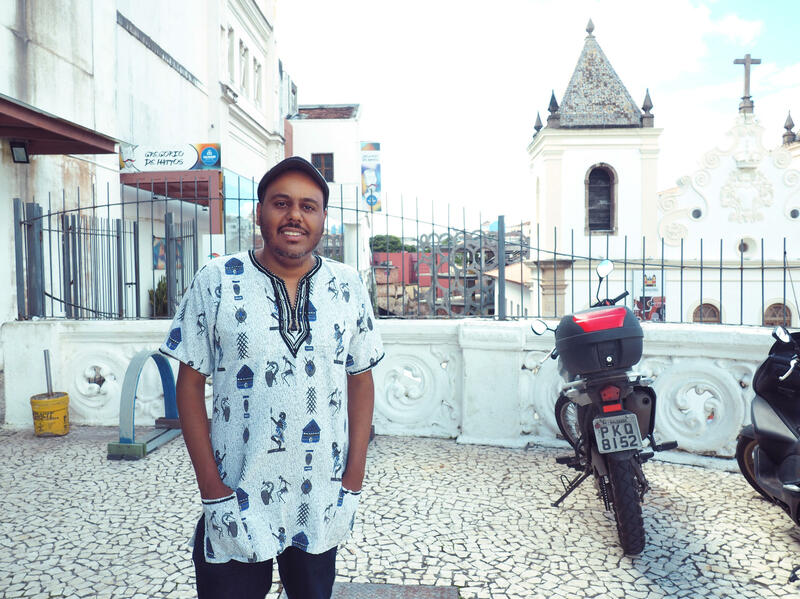 Sauanne Bispo do Nascimento is the founder of Go Diaspora, an agency that facilitates cultural and educational exchanges. Lívia Suarez asks a question during Dendê Valley's business boot camp for startups. Souvenir salesman Paulo Costa wants to expand, he says, but "it's really hard. No one makes this investment." Black Brazilians make up the majority — 54.9 percent — of Brazil's population, and a higher majority among Brazil's poorest. (Many Brazilians are mixed-race and define themselves by a wide range of skin colors. Officially, black Brazilians include those who self-identify in the census as preto — black — or pardo, often translated as brown or mixed-race). On average, black Brazilians earn just over half as much as whites. The wage gap can be higher for black Brazilians with a college degree than for those without. And black Brazilians are not well represented in the upper echelons of business, accounting for around 30 percent of directors of companies with two or more people and around 5 percent of directors of the country's largest 500 companies. "The data points to structural barriers to black Brazilians advancing in the labor market, including racial prejudice," says Alexandre Loloian, an economist with Seade, a São Paulo statistics bureau. Slavery, in practice for more than 350 years, lasted in Brazil until 1888, later than anywhere else in the Americas. Only within the last six years did Brazil begin requiring affirmative action policies in public universities and government bodies, which are now required to accept quotas of black applicants. "No one likes to say it out loud, but Brazil is still all too comfortable with the idea of slave labor," says Loloian. 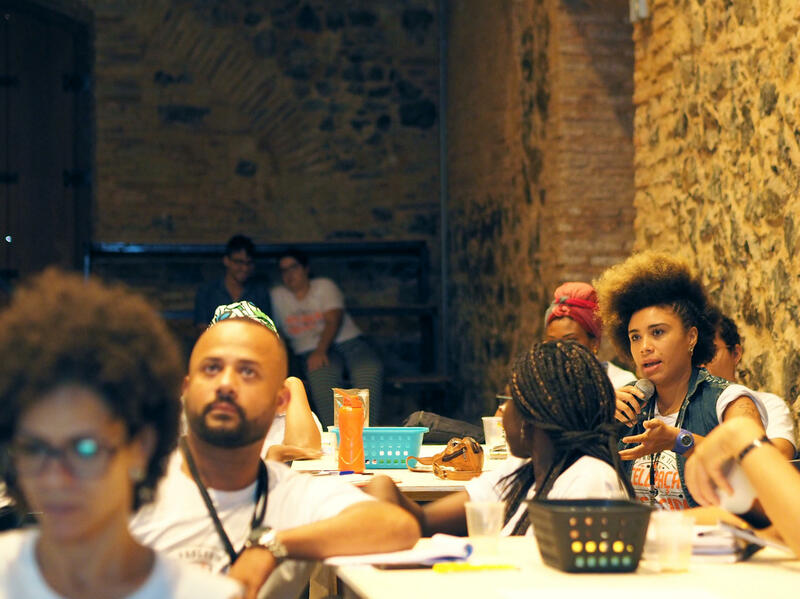 But more and more young Afro-Brazilian entrepreneurs have been starting new businesses promoting their identity — and they are receiving support. Salvador, the capital of the northeastern state of Bahia, has become a hub for Brazilians trying to reduce the racial wealth gap. A strategy known as "black money" is coaxing resources toward black-owned businesses, with the idea that consumer and funder preference for these companies strengthens the black community as a whole. "This strategy has been around since the 19th century, when some black Brazilians would team up to buy others' freedom," explains Paulo Rogério Nunes, a co-founder of a Salvador startup accelerator and consultancy geared to black entrepreneurs. "I wasn't seeing many black people on dating apps"
The accelerator that Nunes and three others co-founded has dubbed itself Dendê Valley, a reference to Silicon Valley but with a nod to dendê, palm oil, an important ingredient in Afro-Brazilian cuisine. Through its doors pass what Ítala Herta, another co-founder, calls "high-potential entrepreneurs who have been underestimated" because "they don't have the profile that investors are used to: white and wealthy." 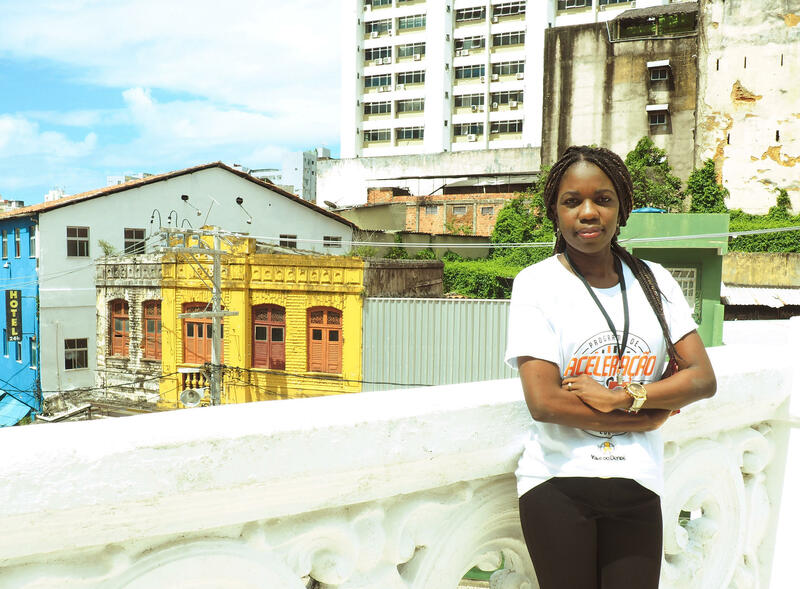 Dendê Valley prioritizes entrepreneurs who are black, women and residents of Salvador's peripheries, and trains them in order to strengthen their business plans and "to make them more competitive when pitching investors," says Nunes. Demand is high: This year, 107 companies applied for the accelerator's 30 spots. Twenty-nine-year old Lorena Ifé's journey to Dendê Valley began, she says, in January 2017, "when I realized I wasn't seeing many black people on dating apps" — even though she knew that 80 percent of Salvador's population is black. Ifé had just begun dating after a breakup. As the mother of a toddler, she had limited time for spontaneously meeting a partner. She also wanted to form new friendships, in part to be able to "go out in places that are majority-white" — bars in the city center, for example, instead of its sprawling outskirts — "and feel safe and comfortable." So she started a Facebook group for black Brazilians to meet and plan social and romantic outings, naming it Afrodengo after a slang word meaning "show of affection" or "loved one." Within a week, 5,000 people asked to join. One year, two Afrodengo marriages, and a packed online album of couple selfies later, Ifé applied to Dendê Valley to develop Afrodengo into an app and business. Hers became one of the 30 companies chosen for the 2018 acceleration round, and Afrodengo now has more than 44,000 members. Dendê Valley, which is funded by Brazilian foundations, chooses startups to support based on social impact as well as business return. Lívia Suarez, 31, runs a company called La Frida Bike, catering to women from city peripheries. She has trained 200 black women and girls how to cycle. 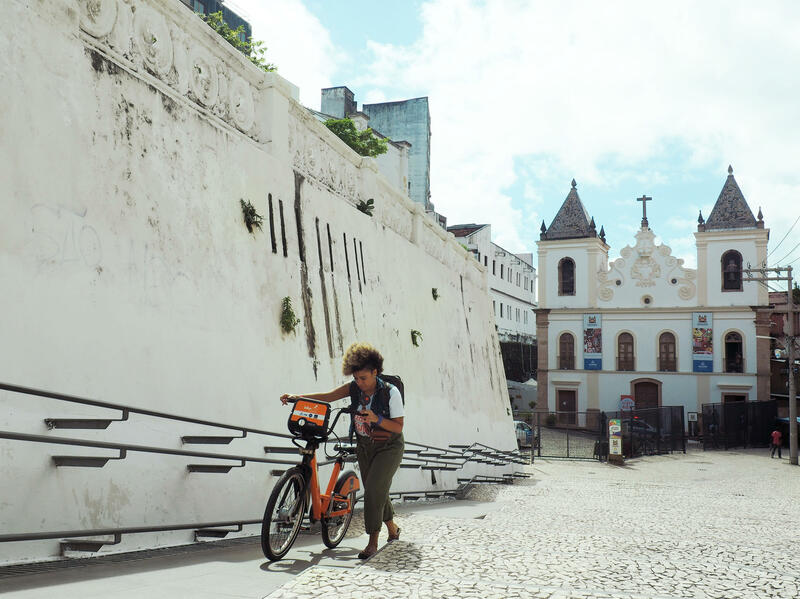 Cycling improves women's health and independence, she says, adding there is a powerful symbolism to being able to "occupy the city" — especially in Salvador, whose colonial architecture recalls its past as one of the largest slave ports in the Western Hemisphere. Now, every Saturday morning, a group of black women cyclists led by Suarez chattily pedals through its streets. It's a social activity on the side of money-making bike rentals and repairs, but Suarez says it is central to the company's mission. Dendê Valley's 30 startups took part in a business plan and legal boot camp in April. Several are currently considering whether to carry out a certification process to become "B Corporations," signaling their transparency and social impact. Their next step, securing investment, "remains a major challenge," says Dendê Valley's Nunes. He and colleagues teach founders about public credit options and funds focused on diversity, such as the Kellogg Foundation's Fundo Baobá, which has a history of funding black-owned social enterprises. They also facilitate direct introductions with potential funders. In late July, the accelerator will take 10 of its startup leaders who won a pitch competition on a trip to meet investors in São Paulo. They've also been invited to apply to present at next year's South by Southwest festival in Austin, Texas. Herta, who previously ran an event production company, says funding difficulties for black business owners are worsened by bureaucracy and low caps on both government and private credit lines in Brazil. "The national development bank overwhelmingly opens its pockets for huge corporations," she says. "It is a stimulus that disregards Brazil's reality and misses a chance to make the economy more dynamic." That critique of the bank is so common that its planning director and evaluation director addressed it in an op-ed in O Globo this month, writing, "It falls to [the bank] to act in a transparent way and evaluate its contribution to development." The bank has announced it will test a new line of credit for small businesses this year, and it plans to launch a startup accelerator in 2019. Nunes will study the new options and work to make Dendê Valley applicants competitive, he says, but questions whether there will be "a clear policy of affirmative action to attract more black and female entrepreneurs to participate." In the meantime, Dendê Valley has teamed up with other Brazilian accelerators in São Paulo, Belo Horizonte and Rio de Janeiro to raise a million-dollar fund for black and working-class entrepreneurs from investors in Brazil and beyond. Conta Black, a financial technology startup in São Paulo that offers low-interest credit, financial education and other services, launched last year with an eye on clients in Brazil's expanding black money ecosystem. Branding focuses on "the message that 'black' is something valuable," says co-founder Fernanda Leôncio, adding that "all types of people are encouraged to join." The company predicts it will more than triple its client base this year. Its founders are betting on a quality they say accompanies black and working-class Brazilians through boom and bust economic cycles: resilience. "How would we have survived without entrepreneurship?" says Sauanne Bispo do Nascimento, whose startup facilitates cultural and educational exchanges. Despite burglary of her offices and a loan refusal from her longtime bank, the 32-year-old has sent over 400 clients abroad and became one of 10 winners of Dendê Valley's pitch competition this year. "I will not stop," she says. "I know how competent I am, and I know how far I can go." Rio de Janeiro producer Valdemar Geo contributed to this story. Brazil is getting ready to hold a presidential election amid a massive corruption scandal and unprecedented levels of deadly violence. 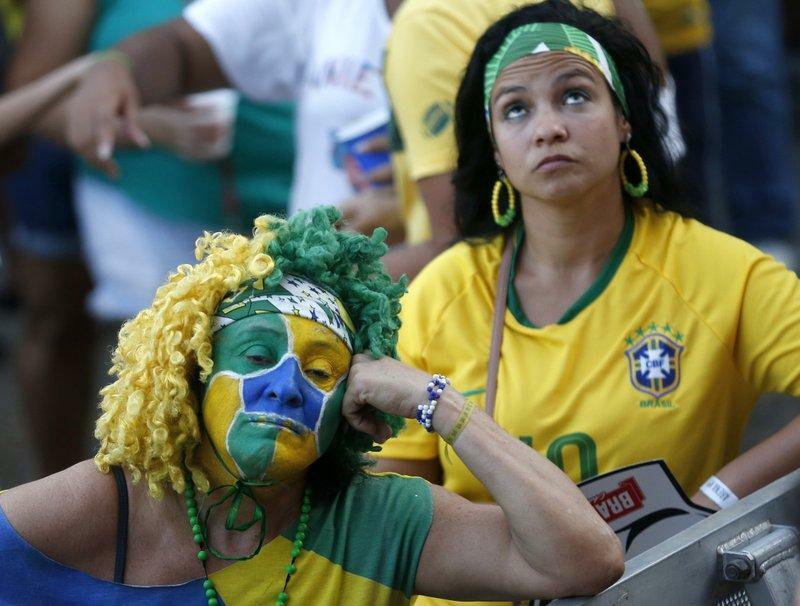 It is clearly a difficult time for many in that country, and young black Brazilians face particularly tough challenges as they try to secure a future amid an economy that is struggling to recover from recession. NPR's Philip Reeves sent this report from Salvador in northeastern Brazil. PHILIP REEVES, BYLINE: In the city of Salvador, there are echoes everywhere of a distant past, when it was capital of Portugal's Brazilian colony and a slave trading port. REEVES: "It's very hard," he says. No one will invest in him. Costa's problem is widespread in Brazil. Ninety percent of black-run businesses consist of just one person. PAULO ROGERIO NUNES: The numbers say that there's institutional racism. REEVES: Paulo Rogerio Nunes is founder of Vale do Dende, an organization based in Salvador that nurtures small business entrepreneurs, especially from favelas, or low-income neighborhoods. NUNES: Seventy percent of the poorest people in Brazil are Afro-Brazilians. And less than 5 percent of Afro-Brazilians are represented in the National Congress. And you have less than 1 percent of black women as CEO in the top 500 companies in Brazil. REEVES: And Nunes says this has a lot to do with history. NUNES: We are the last country in the Americas to abolish slavery, and this has consequences in society. REEVES: Unlike the U.S., Brazil didn't have Jim Crow laws after abolishing slavery. NUNES: The difference is because - when you have a formal segregation, when you finish, you need to change the laws. You kind of address the problem. Here in Brazil, we never had the civil rights movements as U.S.
REEVES: Many Brazilians are mixed-race and define themselves by a wide range of skin colors. Historically, black Brazilians have not had a strong sense of collective racial identity. Black pride movements have been changing that. And now young entrepreneurs are joining the fray with enterprises specifically promoting their Afro-Brazilian identity. REEVES: ...And awoke to find 5,000 requests to join. REEVES: I was desperate, she says. Until then, I'd handled the site alone. She roped in friends as moderators. Ife's site now has more than 44,000 members. She's hoping to raise funds to create a profit-making app. Ife she says she's often accused of racism because her site only accepts people who self-identify as black. She argues the opposite. It's actually inclusive, she says, because it's about securing space within mainstream Brazilian society for its marginalized black population. Livia Suarez is also interested in securing space - literally. She's black and 31. And right now she's cycling through Salvador's potholed cobbled streets. REEVES: Suarez realized a while back that a lot of black women haven't had the opportunity to learn to ride bikes, so she set up a black women's collective that's teaching them. She believes for black Brazilians, it's vital to assert the right to access all urban spaces. REEVES: She says cycling puts you in touch with your own city and its problems. And it makes you more independent and healthy. The collective's already taught 200 black girls and women to cycle and is planning to expand nationwide. SAUANNE DO NASCIMENTO: It's hard to talk to the clients by phone. And then when they meet me - like, you? Are you the person who was talking to me on the phone? Are you the person who has traveled to over 25 countries? Really, you? REEVES: That's Sauanne do Nascimento. A few years ago, she set up a company that sends Brazilians abroad to learn languages. She knows exactly how tough it is to be a young black woman in business in Brazil. Her offices were burgled by thieves who took everything, even the sink. To get up and running again, do Nascimento needed funds. She heard about a bank with a special credit line for businesses like hers. DO NASCIMENTO: So I called the manager. I was able to talk about my business, and he sent me emails. We were exchanging emails. And he sent me the list of documents, and we scheduled a meeting. DO NASCIMENTO: I never heard from him again. He never said even OK, no. He never replied to my emails or even my calls. REEVES: Do Nascimento says she knows why. DO NASCIMENTO: I do (laughter). I do. It's hard to live in a country where most of the people are black and they don't trust us. Actually, I think that they are not used to seeing us in high positions. For something new that requires knowledge, experience, they just don't feel comfortable with that. DO NASCIMENTO: Do Nascimento eventually raised the funds herself and went back to work. Since then, she's sent some 400 students abroad to study languages. She now has four employees. And that's just for starters, says do Nascimento. DO NASCIMENTO: Well, I'm so much determined. I have a commitment with my community. I need them to see that I can travel, I can learn language. So I will never stop. I know how competent I am. And I know how far I can go. REEVES: Philip Reeves, NPR News, Salvador. Transcript provided by NPR, Copyright NPR. Soccer Helped The World Forget Latin America's Dysfunction. Is It Now A Reminder? Right now The Beautiful Game doesn’t look so pretty on this side of the pond. When Belgium knocked Brazil out of the World Cup in Russia last Friday, it meant no team from the Western Hemisphere would make it to the tournament’s semi-finals for the first time since 2006. Soccer pundits immediately began waxing about the seemingly waning role of the Americas on the global fútbol stage. After beating Mexico in Monday ‘s World Cup match, Brazil is now advancing to the quarterfinals. That has plenty of fans happy in South Florida. Now they have another place to celebrate. 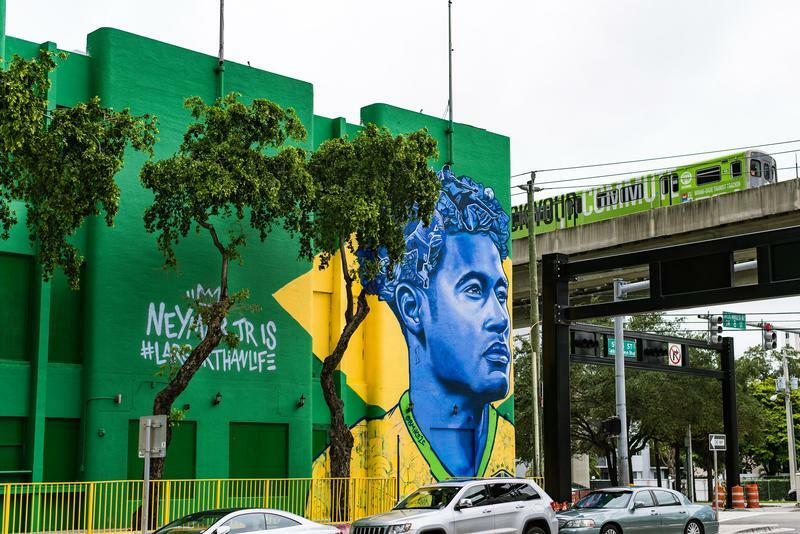 In Brickell City Center a massive mural of the Brazilian star Neymar da Silva Santos Jr. -- who goes by Neymar -- is located on the corner of SW 8th Street and SW First Avenue. This mural was commissioned by the sports website Bleacher Report as part of the #Largerthanlife campaign to coincide with the World Cup.